An anonymous source told Russian news agency Interfax that the Russian defense firm Almaz-Antey has “completed work on the anti-satellite complex” with laser, radar, and ground elements. The laser component is said to be mounted on an unspecified, yet brand-new aircraft. The claim has not been verified independently. Defense One reports that Russia has an existing laser weapons program specifically targeting satellites, and that the program builds off similar Soviet-era efforts such as the Beriev-A-60 gas laser and Kontakt 30P6 programs, which used modified Soviet aircraft to disrupt satellites or bring them down using missiles. The U.S. depends on a network of satellites to direct advanced weapons systems aboard land vehicles, aircraft, and ships to carry out precision attacks, and to detect the launch of nuclear warheads. “Russia considers American satellites a significant threat when it comes to potential confrontation, and is actively working to counter U.S. technologies in space, such as possible electronic warfare technologies that can target hundreds of kilometers up. The developments in laser technologies are in step with U.S. and Chinese advancements in this area,” Samuel Bendett, a research analyst at the Center for Naval Analyses, told Defense One. 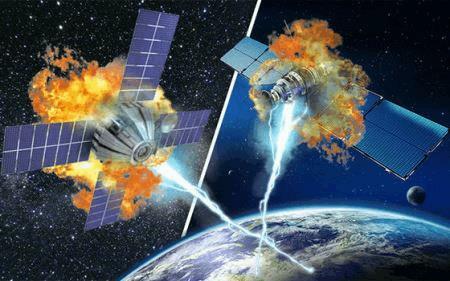 Pentagon's Joint Staff intelligence directorate reported in January that China and Russia are ramping up development of anti-satellite missiles and other weapons, including lasers and jammers that can blind or disrupt satellite electronics. Officials say the two countries could be capable of attacking low-earth orbit (LEO) satellites as soon as 2020, according to The Washington Free Beacon. Some of the U.S. military's newer satellites are designed to overcome enemy jamming and withstand other potential offensive actions, reported CNBC. Michael Krepon, a space security expert and co-founder of the Stimson Center think tank in Washington, D.C., told the news organization, "My guess is that our capabilities to carry out a war in space are a lot better than the Chinese and Russians." Some observers believe the U.S. Air Force's secretive X-37B plane is being tested as a space weapon designed to capture or damage enemy nations' satellites — a claim denied by military officials. What they are more forthcoming about is the testing and deployment of directed-energy weapons systems not necessarily intended for space. For fiscal year 2019, the U.S. Navy requested a $299 million budget for rapid prototyping, experimentation, and demonstration of new ship-mounted laser systems, according to USNI News. Specifically, the Navy intends to buy four ship-mounted Surface Navy Laser Weapon Systems (SNLWS), which include a High Energy Laser with an integrated low-power laser dazzler to counter unmanned aerial vehicles (UAVs) and smaller craft. It also wants to install two Optical Dazzling Interdictor Navy systems (ODIN) on Arleigh-Burke-class guided-missile destroyers. In addition, the Navy plans to test a 150-kilowatt solid-state laser weapon system aboard its San Antonio-class (LPD-17) amphibious warships. This is a significant upgrade from the 30-kilowatt AN/SEQ-3 Laser Weapon System or XN-1 laser weapons system (LaWS), installed aboard USS Ponce (AFSB(I)-15) and field-tested in 2014. Achieving beam power to between 150 kilowatts and 300 kilowatts will make lasers capable of destroying some types of anti-cruise ship missiles, officials say. The Missile Defense Agency also proposes to spend $66 million for developing laser-firing drones to intercept intercontinental ballistic missiles. In addition to testing lasers with higher power, such as the U.S. Army's High Energy Laser Mobile Demonstrator (HEL-MD), smaller, and more feasible projects already have been fielded. For instance, a 5kW laser project, part of the Mobile Experimental High Energy Laser, already is being used by U.S. Army Stryker armored vehicle units in Europe to shoot down drones, according to Richard DeFatta, a civilian director of the Army’s Space and Missile Defense Command Future Warfare Center, reported Army Times.